Loft Ensemble has found its sweet spot in a re-imagination of Robert Louis Stevenson’s buccaneers and buried gold adventure novel, Treasure Island in Long Joan Silver, written by playwright Arthur Jolly, directed by Danielle Ozymandias with fight direction by Mike Mahaffey. A two-hour, paired-down, mostly female cast comedy, the literary classic coming-of-age story is transmuted into an incredibly entertaining modern farce, ripe with perfectly inserted and delivered one-liners, silly gags that work in every pause for a laugh, and a swift sailing narrative that stays engaging throughout. 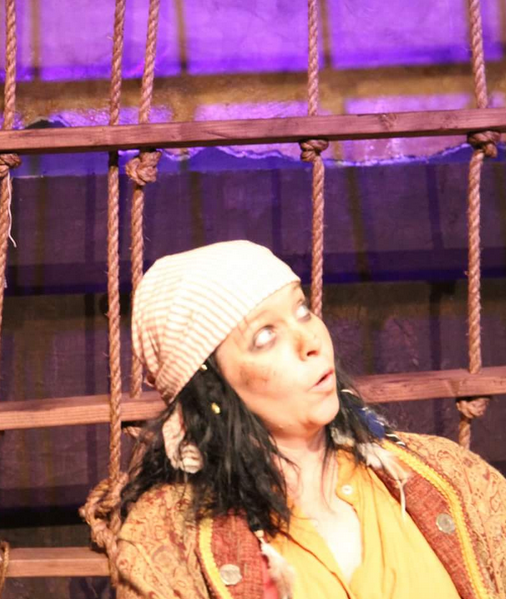 A young Jim Hawkins, working at his mother’s inn, is given a map, by rum-sotted, pirate-on-the-run, Sally Bones (Marissa Galloway), who dies from too much drink, just as a scrappy gang arrives to claim it. Jim must flee for his life to protect the valuable object. To find the hidden treasure that many a man – and woman has died for, Jim, along with uppity Squire Trelawney, questionable Doctor Livesy and a reluctant Captain Smollett, set out on the Hispaniola with a mangy crew recruited by a mysterious, one-legged sea-cook, Silver. From the beginning to the end of the voyage Jim and Silver forge an off-handed bond which, even through betrayal and battle, in the end, saves both their lives. Long Joan Silver under the audacious direction of Ozymandias, does plenty to foster the appreciation of pirates, parrots, treasure maps, rum, deserted islands and sword fighting and stays fairly center of Stevenson’s original ideas of moral ambiguity. And although the themes of discrimination, privilege, and greed are explored here, they are given a delightfully digestible light touch throughout including Captain Silver, played by a gritty Bree Pavey who is so likeably sinister and opportunistic. Ilona Concetta as Jim Hawkins naively keeps the moral compass for all while attempting to explore burgeoning teen hormones, though constantly thwarted by his mother Mrs. Hawkins (Jennifer DeRosa). One of the best players in this production is Kristian Maxwell-McGeever as a quippy, amoral Squire Trelawney whose timing sets a driving comedic tone and who is able to justify every deliberate misstep and sew up the play. The shining stars of this production, however, are Mike Mahaffey’s thoroughly uncontrived fight choreography, full stage and house set design by Mitch Rosander, set decoration by Lauren Sperling, lighting design by Tor Brown, foley by Ashley Crow and costumes by Danielle Ozymandias.